Just a quick heads up to let you you guys and gals know about a promotion from Aio Wireless which sees the no-contract carrier giving a smartphone away for free. 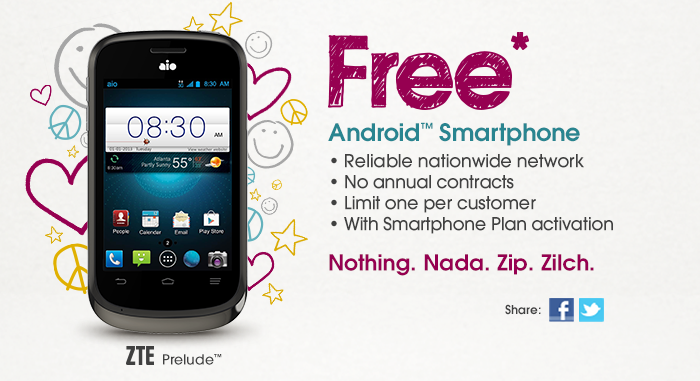 Effective a few weeks back, the carrier is offering the ZTE Prelude at no cost to the customer. Given there’s no long-term contract to worry about, this amounts to a free phone with commitment. Note that this is a limited time offer and will only be around while supplies last. You’ll still have a $25 activation fee, but this deal works on either of the carrier’s $55 or $70 smartphone plan. Also, you’re limited to one of these promotions per customer. Aio Wireless plans range are affordable and work for any budget: $40 (Basic – 250 MB), $55 (Smart – 2 GB), $70 (Pro – 7GB). If you’re in the market for a first smartphone or one that won’t potentially break your bank, the ZTE Prelude from Aio Wireless is tough to beat. No, it’s not a powerful device designed for gaming, but it’s a great stocking stuffer for the grandchild or grandparent in your life. From now through December 8, Aio customers can check-in for charity at any of the Aio stores around the country. Doing so will see to it that $5 will be donated to Toys For Tots and ensure underprivileged children have a holly-er jolly-er holiday season.